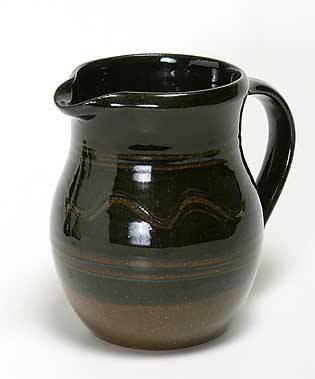 John Solly jug - 5⅜" (136 mm) high. John Solly was born in Maidstone, Kent in 1928 and it was there that he set up his pottery at London Road at the age of twenty-five. John's background was impeccable; he had studied at Maidstone School of Art and the Central School of Art in London, and had worked at Rye Pottery with Jack and Wally Cole and at Winchcombe with Ray Finch. He produced domestic wares in earthenware at Maidstone for thirty-three years, and then moved to Peasmarsh, Sussex. He did much to encourage new potters, taught at the Mid-Kent Adult Education Centre and lectured around the world. John died in July, 2004.